Year after year, Glendale’s The Farm Home Haunt has been expanding their maze by adding new and amazing details. This family of Halloween enthusiasts uses the limited space of their driveway and front yard to create a strange world set in the Old West which contains deviant characters, mutant creatures, talking skeletons, and bloody body parts. The story of the cursed Farm Home barn tells of an 1800s family who went insane after a string of bad luck. The barn then became home to a cult of society’s outcasts who worshipped the owner, Eli. Joining this group of misfits was Doctor Small, a man accused of medical malpractice who specialized in making hybrids of humans and animals. Together, this group of deranged outsiders made the cursed barn their home... and a nightmare for all those who dare visit. As you journey through the maze you will meet many demented characters including a woman who wants you to kiss her skeleton baby, an axe-wielding boy who you wants you to carry human body parts for him, and Dr. Small who asks you to hold the intestines of the patients he is mutilating. If you pay close attention you will notice that among the Western decor there is ephemera from neighboring haunts including a Rotten Apple flyer and the paper which Frank the Rabbit hands you in Opechee’s Donnie Darko Experience. Towards the end of the maze you come face to face with one of Dr. Small’s pig/human hybrids who is being chased by a very impressive robotic horse skeleton. 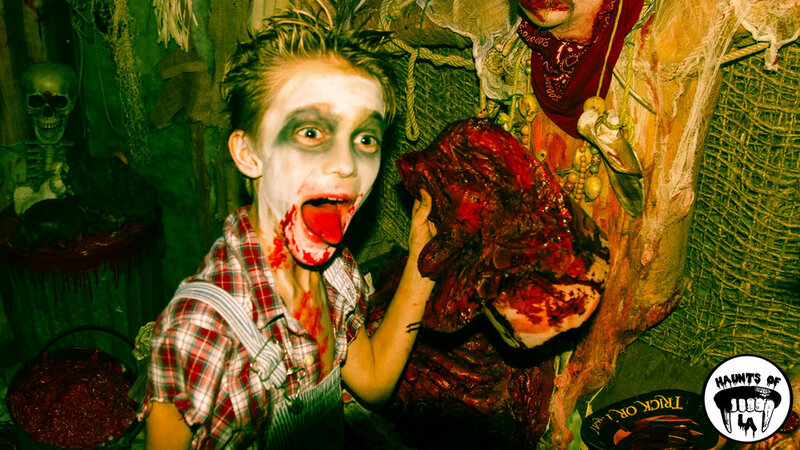 The Farm Home Haunt is an incredible feat of Halloween magic and is only open for one night and on Halloween. For those who want to meet the cult of the cursed barn and witness a twisted take on the Wild West, we reckon you should “saddle up” and “mosey on over” to visit this inspiring Glendale haunt!